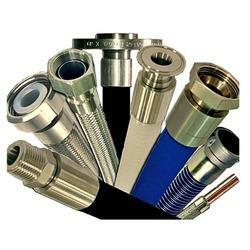 Powerflex Industries has carved out a niche in the field of manufacturing Food Grade Hose. This product is fabricated using high quality Teflon. The production of this hose is done as per the prevailing standards to ensure that they are safe to use and durable. These are also tested as per the international quality standards. End Fitting Grade: SS304, SS304L, SS316, SS316L, Brass And Other Grades on Request. Looking for Food Grade Hose ?